The NLDS between the Washington Nationals and Los Angeles Dodgers moves to the West Coast, entering game 3 tied at 1-1. It’s been quite close so far in both games, with starting pitchers disappointing on two occasions for both teams. Usually the better bullpen has been the difference, along with some delivering the big home run. Once it was Justin Turner (game 1), the other time it was the surprising Jose Lobaton. 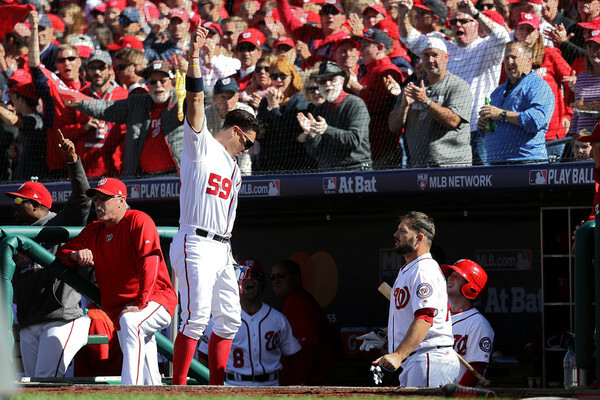 Previous game: After the Dodgers scored two quick, early runs, the Nationals responded by taking the lead off of a three-run homer by Jose Lobaton, followed by two RBI singles from Daniel Murphy. Both Rich Hill and Tanner Roark looked a bit overwhelmed at the stage, while the Nationals got a terrific job out of their bullpen, especially Blake Treinen, earning the win while striking out 2 in 1.1 innings. Starting pitchers: Gio Gonzalez will be on the mound for the Nationals. The 31-year old had a disappointing season with a 4.57 ERA while allowing batters to hit better than .260 for a second straight season. He has improved his ability to avoid walks while not losing too much power, posting a 2.90 KO/BB ratio. He was very good in his sole appearance against the Dodgers this season, allowing three hits and one run in six innings, the Nats winning 8-1. Overall he has a terrific record against Dodgers hitters, giving up just one home run among all of them, to Carlos Ruiz. Kenta Maeda in his first major league season will be on the mound for the Dodgers. The 28-year old Japanese righty posted a 3.48 ERA through 175 innings this season, posting an impressive 3.58 K/BB ratio, allowing batters just a .229 average. He hasn’t pitched against the Nationals this season. Hot bats: Daniel Murphy is probably the one name above everyone, going 4-for-6 with a couple of RBIs and drawing two walks. All but one: Justin Turner, also batting .667, including one home run and two RBIs. Ryan Zimmerman has been doing pretty well too, batting .429 in this series although he still doesn’t have an RBI.